What has living in a small space allowed me to do? For better or worse — and I think worse based on the current crazy things going on — I’ve been doing a great deal of digging. One thing I’ve notice is that although a lot is being posted about replacing the Affordable Care Act and the work that “Committees” have been doing, it is not quickly visible who the committees are and who is in them. The Committees in the House of Representatives who just approved a repeal/replace plan are: Energy & Commerce Committee (23 Democrats and 29 Republicans) and Ways & Means Committee (15 Democrats and 24 Republicans). Want to know who are the members of these Committees in case you want to contact them. Well here are links to their websites. Of course, they make it difficult to email them directly (haven’t found a place that lists their emails yet) but you can communicate to them via a form on their site or call them. This information is listed. Enjoy! Selecting a Tiny Space — What’s Right for You? AND — Absorption Refrigerator — Bring Your Cooler! You’ve figured out where you want to live – moving around, staying in one place. What do you think about when buying a tiny space? It certainly will vary based on your lifestyle and cashflow. I’ve watched programs on purchasing tiny spaces on wheels a lot. The tiny houses look great – cute, a little house on wheels. We’ve also had a trailer, and my son is living in a 36’ fifth wheel while he builds his house. What about buying a tiny house in town? They all are viable options now that you’ve found a space to live on. Here are things we thought about. For me, tiny houses on wheels makes one feel like they are living in a house, because they look like a house only much smaller. To be mobile, however, the typical tiny house does have certain limitations – not too high, not too big, not too heavy, limited storage, typically the bed is upstairs and reachable via a ladder or stairs with typically no headroom to stand up in and are mobile. For younger people, climbing up a ladder to get into bed has some whimsy to it. However, since I am retired, thinking about climbing a ladder when I wasn’t too keen about climbing stairs in my house all the time is an obstacle that I didn’t know I wanted to overcome. There were other things I was thinking about. As I looked at the storage space inside them I questioned whether or not there would be sufficient space for the things I wanted to keep with me. Remember, I was moving from a 2,500 square foot house with a barn and a storage shed to a small space. Although the idea of great insulation and building materials that create that “real house” look is what makes tiny houses so appealing, it may make them heavier that RVs since they focus a lot on using lightweight materials. We have a truck, but it has weight limitations. It also may be more difficult to maneuver than a trailer and have greater wind drag – an issue when the winds are strong from both a hauling perspective and a gas mileage perspective. What about height restrictions? That might be an issue when hauling it down the road. And then there is the size of the refrigerator, its weight, compost toilet versus black tank, water tank or no water tank. Then, there is the fifth wheel or trailer. You need a truck to haul a fifth wheel. The benefit of a fifth wheel over a trailer is that typically the bedroom is over the bed of the truck when connected reducing the length of trailer being hauled behind the truck (about five feet). Trailers and fifth wheels are built with aerodynamics in mind reducing air drag. Both are pretty maneuverable as they are built for towing and height clearances. In a fifth wheel, there are stairs – three typically – but when in the bedroom most people can stand up to change clothes. Weight is an issue no matter what you purchase, but trailers and fifth wheels have been focusing on reducing weight as much as possible for years. By using lighter weight materials as much as possible, you can find RV units that are relatively light while creating a comfortable living space. But what about wintering in one of these units in a cold climate? Well, if you need to purchase an older model, you probably will have issues unless you take steps to avoid freezing of pipes, water lines, etc. There is a great deal of information out there on how to address this. If you are buying a new unit, they often come with arctic packages but these vary by manufacturer. You need to educate yourself on the model you are looking at, because more often than not the dealer selling these units does not know the particulars. Often, the RV is tested in a zero-degree environment but with no wind. Makes a difference. Do you have single pane or duo pane windows in the rig? Duo panes have advantages and disadvantages but do provide more insulation capabilities. And with so many windows in today’s trailers, it certainly can make a difference. Oh, and did I mention the REFRIGERATOR!!! Depending on the unit you purchase, you may have a refrigerator that switches between electric and propane or runs only on electric. I’ll cover issues on this below. And what about those appliances such as your stove. Does it run on propane? What elevation do you plan to be at? It may make a difference on how efficiently it runs. So maybe a tiny house in a community is the answer for you. Purchasing something small can have great advantages if you need to stay in one location. And, if you are downsizing from something bigger, as we did, you may have some cash in your pocket to apply toward the purchase price. And, you are potentially building equity. I say potentially, because you never know if your investment is going to increase in value or decrease in value. In past years, real estate was a great investment if you made a good purchasing decision. Typically, the value of our purchase went up. Today, you may buy a property and find you are under water (the value is less than what you owe). HMM. You have a house and have locked into a monthly payment that includes insurance and taxes (if your loan is a fixed mortgage) so there are no surprises – rent going up – although insurance and taxes do fluctuate to some extent at times. The downside is that typically a house will be larger than a tiny space so your utilities will be higher. You often also need a down payment to purchase a house. If you don’t put 20% of the purchase price down, you’ll be faced with mortgage insurance for a number of years – a very expensive requirement of loans without this down payment. The benefit of purchasing a tiny house is that you have a place to stay in the community you want to live in. The disadvantage is you have a place to stay in the community you want to live in. What if you lose your job, want to explore new things? You have to sell your house first or rent it out if that works for you. You are much less mobile. In thinking of these options, we chose to live in a fifth wheel for a time with the intent longer term to purchase a smaller house. A fifth wheel made sense to us, but we had to be careful about the gross vehicle weight rating (GVWR). We have an F250, gas engine – not diesel. So, our maximum was 11,900 lbs. GVWR. When looking at rig above 30 feet, that is a challenge! We chose a Grand Design Reflection 303RLS which is 33 feet long and has a 11,900 GVWR weight. We purchased a new rig so we could have the manufacturer install duo pane windows. There were no rigs in the US with duo pane windows – only in Canada. They all come standard with an Arctic Package – R9 wall insulation, R33 roof insulation, and a heated underbelly with all pipes covered and heated. We live in Colorado so it does get cold here. The coldest it has been is 6 below zero in December. We didn’t have time to put covering around it to reduce wind, but it has really been mild (typically around 20 at night and 40 in the daytime) except for several days when the temperatures dropped. We’ve been living in it for a month and are learning from experience. On advice of others, we keep the black tank closed and only dump it once a week. Enzymes work in these tanks and create natural heat I am told. We were told if you keep the tank open, it very well may freeze. We keep the gray tank open all the time. Our hose to the dump site is elevated so it doesn’t sit on the ground. When we flush the tanks, we close the gray tank for a while to build up gray water (about a day) so when we flush the black tank we have gray water to flush out the hose. We like to keep our temperature at 68 degrees inside. We put a thermometer in the pass through storage area and the temperature is holding nicely with the heated vent. We did buy a heater just in case we needed to supplement the heat in that area. So here is the nemesis. The refrigerator! On our unit, they installed one that can be run on electric or propane. Basically, there are two manufacturers of these refrigerators. First, because it requires venting and pipes for the switch between gas and electric in the back, the refrigerator in our unit is very small. A similar electric unit with the same height and width dimensions is about 2 cubic feet bigger because it is deeper than this frig. An RV refrigerator that switches between gas and electric is known as an “absorption” refrigeration system. No pumps or compressors are used. A combination of liquid water, ammonia, and a rust inhibitor are used in this refrigerator. You can learn all about this system by going to Wikipedia – https://en.wikipedia.org/wiki/RV_Fridge. I liked this explanation and the drawing as well – http://bryantrv.com/reefer.html. Basically, some type of heat input is needed in the cooling unit to causes a chemical reaction in that unit (Daltons Law). The chemical reaction in the cooling unit is very sensitive to heat and COLD. If it is too hot (keep good ventilation) the cooling unit gets too hot. If it gets too cold, it disrupts the chemical reaction in the cooling unit and will not cool. Although it is often stated that if the temperature falls below 32 degrees, there will be a big drop in absorption performance as the ammonia mixture has some water and other chemicals that gel or crystallize in freezing temps the reality is that if it gets too cold, the unit will freeze up and not allow any gas to flow through the system – a log jam so to speak. Around Christmas, our refrigerator stopped working. Everything in the refrigerator had to be thrown away or put in a cooler outside. Have you ever tasted frozen lettuce and carrots? Very interesting. That’s when I learned from Norcold (Nevercold) that the refrigerator was not designed to work under 32 degrees unless a “Cold Package” was installed on the back of the refrigerator. Basically, a cold package is heat tape applied to the absorber coils to keep them warm during the winter. Of course, in the summer, you need to disconnect this heating element or the coil will be too hot. REALLY? We purchased a “cold weather ready” RV and a refrigerator was installed that wouldn’t operate properly under 32 degrees. I wouldn’t even have thought to ask the question. It makes no sense. Although we are living in our fifth wheel right now, we can have snow in the mountains when dry camping in June. Think the temperatures at night are above 32 degrees at night? Hardly. And from what I’ve been reading a similar problem may exist when temperatures reach above 80 degrees. 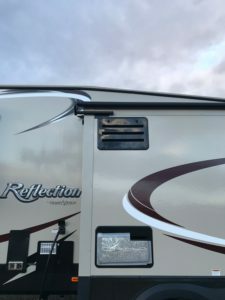 So, after a great deal of debate with the trailer manufacturer (our RV dealer was closed over Christmas), it was agreed they would pay for the $80 part (Cold Pack) and “reasonable” installation on the Norcold refrigerator they installed in our new fifth wheel. We had it installed several weeks ago, and everything was running fine. Well four days ago, the refrigerator stopped working again. Everything went back in the cooler! Again, frozen lettuce which had to be thrown away and frozen carrots. I called our RV dealer this time. Of course, Grand Design told them it was a Norcold/Thedford issue and talk to them – they don’t want any part of this problem even though they selected to install this refrigerator in our fifth wheel without telling us that our Arctic Package unit had a refrigerator that would not work in cold weather and did not give us an option to install something else that wouldn’t cause this problem, e.g. Nova Kool 9000 that runs on electric and when dry camping can run off solar. Called our RV dealer again. They’ve been great about handling this issue. They contacted Norcold/Thedford who would not do anything unless a technician looked at the refrigerator. For us, that meant either hauling our unit back down to the dealer (a 70-mile trip one way) — to haul our rig there, my husband has to take time off of work, we have to stay in a pet friendly hotel overnight, and find someplace to store our free-standing freezer we have in our trailer – a huge hassle – or pay for a mobile RV mechanic to come to us! Of course, we were responsible for these costs. So, of course, I opted for someone to come here. Duct tape and silver insulation to reduce cold air. Well is this problem unique. Of course not! Even with the heat tape, apparently, the ammonia/water solution froze in the absorption coil creating a blockage. Solution. Take the bottom vent off. Run a heater in the cavity for 24 hours surrounded by aluminum insulation (the kind used on garage doors) so that most the heat was directed to the back of the unit and not to the outside. Remove the heater. Tape the lower vent completely except for 6” on the top opening of this vent. Tape the first opening on the top vent. Our fifth wheel has a lower and upper vent on the side slide out rather than a vent on the side and top – a much better design for air flow on absorption units. Put the vent back on. Turn the refrigerator to gas rather than electric and run it on that mode for the day. Tonight, switch back to electric and see what happens. If it stops working, something is wrong with the electric. If it keeps working, the cooling unit was getting too cold even if the heat tape so wouldn’t work. Right now, the refrigerator is set at 3 and the freezer temperature is about zero and the refrigerator is at 38 degrees. It’s been running for three hours now. I’ll put food back in the refrigerator once I validate that it works properly on both gas and electric. Of course, in a couple of months, if this works, I’ll need to remove the tape from the vents and, when it gets hot – which it does here – put a fan in to circulate the air so it doesn’t get too hot or will have the same problem in reverse – too hot rather than too cold. 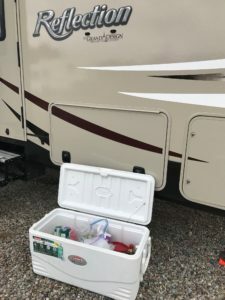 Wouldn’t you think with all of us full time RV’ers or those wanting to camp during hunting season when it gets really cold or in the early summer or those camping in hot and humid climates that RV manufacturers would think about looking at more appropriate refrigeration systems? Guess it’s too hard to step away from technology that has been used since the 1950s. Heck, that technology is as old as I am. That’s scary!! 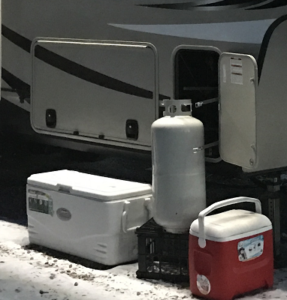 So, if you’ve purchased an RV that’s designed to be comfortable in cold weather, don’t forget a big cooler. You may need it. LOL – life above 5,400 feet in a space that is about 300 square feet. Author dogdaysmedia_ouzimxPosted on February 3, 2017 February 3, 2017 1 Comment on Selecting a Tiny Space — What’s Right for You? AND — Absorption Refrigerator — Bring Your Cooler! People think the first barrier to overcome when going tiny is getting rid of stuff, selling your house or just selecting the right space to live in – your new house on wheels. If you plan to live a gypsy life – floating from space to space – the place to park your tiny house won’t be a big issue. There are campgrounds all over the U.S. that will welcome you. Or if you plan to go South to a warmer climate you probably can quickly find a place to stay longer term, because these locations have welcomed seniors for years knowing the value add they bring to your community. They spend money in it – buying groceries, eating at restaurants, going out to movies, buying locally. But in other places that welcome mat may not have been put down yet. So, my suggestion to those considering this new way of life is to make sure first that you plan where you are going to stay in your tiny space. If you can’t park it somewhere you are in trouble – a house on wheels with no place to live!! If you choose to park it on your own land, what might the issues be? Well first you need power, water, and a system to dispose of your black and gray waste. If you only have power and water, you’ll need to move it frequently to dispose of your waste if you have tanks as they aren’t that big. Or your tiny house may have been built with the assumption that you’ll always be connected to a dump station. And, does your land have an HOA associated to it. If so, what are the restrictions? Single family, modular, stick built, size of house, etc. You may be surprised to learn that you own the property but are restricted regarding what can be placed on that property. What if you need to stay in an area because of jobs, schools, family, etc. and don’t have land? You need to think about how many campgrounds are around and what they are like. Is it appealing to live right next to your neighbor? How close will your neighbors be? What kind of neighbors will they be? How clean and updated are the facilities, e.g. showers, laundry facilities, toilets, pool? Unless you have a very expensive tiny house, it is much more pleasant to take a hot shower at the campground rather than shower using the small volume hot water system installed in your tiny house. How long can you stay in the campground? Yes – some do have restrictions on length of stay. What is included at your space? Do you have dump capabilities at your site? Some do while older campgrounds don’t. Does the site offer free electric as part of the price or is it metered? Does it offer Wi-Fi and how fast or slow is it? Is cable television available at your space? If so, can you upgrade the service so you can get a broader selection of shows and a receiver that can record when you are not at home. Does the campground allow pets and what are the rules regarding them? We are lucky. We have two dogs, and our campground has a great fenced in dog area. But even with this convenience, it is much different for us to wake up every morning and walk the dogs rather than just let them outside. And, I’m use to picking up their poop to keep the yard nice but not while it is still warm. Well just saying. Your first step in thinking about going tiny is figuring out where you’ll live not what you’ll live in. That’s the easy part. Sport sleeping by the fake fireplace. It’s been an interesting winter. First part of January was below zero at night for a couple of nights. Then the temperature sprang up to between freezing and 40 degrees. We have a senior dog, Sport, so he needs to use a ramp to get in and out of trailer. It freezes, and we slide down it. Bring it inside, and it defrosts. Have to time defrosting the ramp to when he’s relaxing. Oh, another challenge of this winter has been our Norcold N811 7.5 cubic foot refrigerator that was installed at the Grand Design factory in our Reflection 303RLS fifth wheel. We had our rig built rather than buying it off the lot so we could have duo pane windows installed. Arctic Package comes standard. 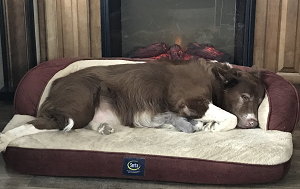 The good news is even with below zero temperatures, we are staying warm and cozy and our underbelly is staying warm enough to protect our pipes. We didn’t have time to skirt the unit since we picked it up the middle of December. 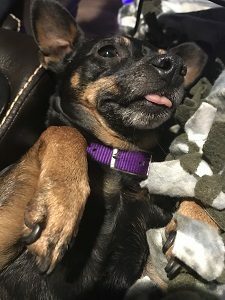 Bella sticking out her tongue. The bad news is Grand Design put in a refrigerator that doesn’t work if the temperature outside is under 40 degrees. So for much of the first month in the rig, we’ve had to use a cooler for our food. Since it’s been cold, we’ve left it outside. Yep, lettuce, carrots, and other refrigerator items froze. Ever eaten carrot popsicles? Found out that there is a part – Norcold Cold Weather Kit – that is installed on N841 units (the newer version of N811) to resolve this problem but not on the one installed in our rig. Go figure. Grand Design prepped this unit for the cold but didn’t think to put in a refrigerator that would work in cold weather? These units are built in Indiana. Doesn’t it get cold there in fall and spring? In Colorado, in June it can snow in the mountains. The temperatures drop below 40 degrees even in the summer. Well it is being fixed. But we have to haul the rig 70 miles. We are waiting for snow and ice to clear before the issue can be resolved under warranty. Now to cabin fever – a result of living in a small space! It can be a positive thing if you can’t stand to sit on your behind in your recliner watching television all day. Boredom sets in, especially if you’ve been active all your life. So, I joined a gym. Not a New Year’s resolution but a need to get up and moving. At my age, moving is a key to staying healthy. I’ve spent the last couple days using the strength training machines – legs, arms, hips – and using the eliptical, treadmill, and exercise bike. Since the televisions are each set to a single channel – boring – I bought a Bluetooth headset and signed up for Sirius Internet. That setup also challenged me. How do I set up the headset to work on my iPhone? What service should I use? How do I get the music to play through my headset? I know for many that is as easy as 1, 2, 3. But although I am very computer literate, I’ve always been cell phone illiterate. Thank goodness for the Internet and its resources. I think I’ve figured it out. It’s a gym day. Let’s see if I’m smarter than the technology or the technology is smarter than me! About sixteen years – that’s how long it’s been since I’ve gone skiing. Why? Well that last time I went someone on a snowboard at Breckenridge skied right over the front of my skis. There were too many people skiing. I was being careful but others weren’t. With the thought of getting hit by a snowboarder going fast down the slope, the sport was no longer appealing to me. At that time, I was in my 50’s. Well my grandson got a snowboard from Santa at Christmas. Went with him and his dad to Sunlight Mountain Ski Slope on Christmas Eve and watched him try his board for the first time. There were people on the slope but it wasn’t crazy busy. The next week we met them at Powderhorn Ski Resort. Again, it was busy but not crazy busy. Plans were made to come again the following Sunday and for me to try the slopes myself with moral support – my son and grandson. Driving up to the slope was my first challenge. Have a four-wheel drive F250 but took the shortcut (DeBeque exit) and meandered around snow packed curves and up and down mountain roads. My heart was pumping. When I got to the slopes, the next thing was to get fitted for boots and skis. Done. While my son and grandson went snowboarding, I started my new journey – getting comfortable on skis. Powerderhorn has a “bunny” run that is a very small slope. You go up on a moving ramp. Over the course of a couple of hours, I relaxed and found my ski legs again. My son asked if I wanted to go up on the lift with them to the begginer’s slope. Sure – why not? The morning had been beautiful. Snow falling softly and no wind. By the time we went up on the lift, the snow had turned to sleet. Without goggles or face protection, the snow felt like pins when it hit my face. But the minute we got off the lift, the trees sheltered us. It was wonderful to be back on the slopes. 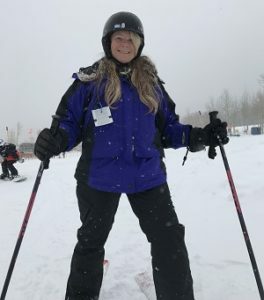 How amazing the body is – before I knew it my legs were doing exactly what they needed to do to safely ski down the slopes. I fell in love with this sport all over again. Crisp mountain air, pristine snow paradise, and the knowledge that it doesn’t matter how old you are, you can do whatever you put your mind to do. Propane tank doesn’t fit in hatch! Well, we had purchased an extra 30 gallon propane tank in case we ran out of propane in the two 30 gallon tanks stowed in the hatches in our rig. If both ran out, we just needed to put the spare in. Well we forgot to measure the height and width of the opening. Yep. The tank didn’t fit. We left the hatch door open so we could attach the gas line and set it on a plastic carton. Apparently, even though the hatch is somewhat open underneath, the closed doors do provide some cold air barrier to the inside of the rig. Think that was the culprit. Lesson to be learned – don’t buy a tank that doesn’t fit the opening. Oh well. Live and learn . . . LOL – life above 5,400 feet in a space that is about 300 square feet. How the heck did the Swiffer floor duster pads get in the breadbox? Ah life in the tiny house. As tiny as it is, believe it or not, you lose things. Bought a new controller for my Visio TV. Had it one night and lost it. Are you kidding me? Have looked in every cabinet and drawer. Believe me there aren’t a lot! Cleaned the whole place. And, still haven’t found it. So why would I question finding the dusters in the breadbox? Maybe I thought that would be a good spot for them. After all, it isn’t full to be brim. Or maybe, they walked into the breadbox themselves. Maybe the dogs did it. They are so talented, but I know I didn’t teach them to do that. Still trying to get organized even though I doubt it will ever be done. Tiny spaces require a lot of creative space usage. Recommendation — measure the space, figure out what fits, and find bins, racks, etc. that work for what your storing and the space you are storing it in. Maybe tomorrow I’ll get there. But today – it’s too cold outside to think about it – minus 6 degrees this morning. My brain is frozen! LOL – life above 5,400 feet in a space that is about 300 square feet. Anywhere the wheels take us.